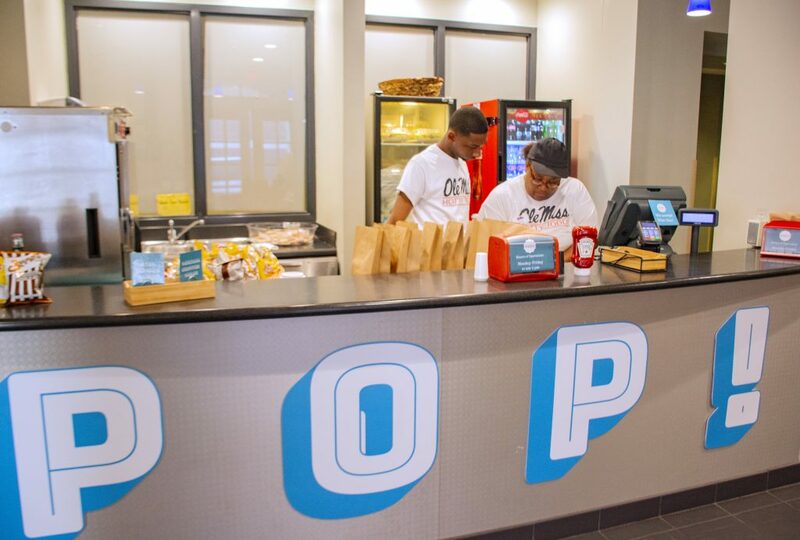 Dodo Pizza, a popular Oxford pizza option, officially closed its on-campus location in Weir Hall and has been replaced by a new pop-up restaurant called POP!. “POP! is a true pop-up venue with a revolving menu that changes weekly,” the Ole Miss Dining Instagram page reports. Pop-up restaurants are designed to be temporary, with limited and changing menus. Ole Miss Catering prepares and stores the food, which is brought over to POP! multiple times throughout the day, depending on the frequency of orders. The prepared food is stored in bags that are made available for students and faculty to grab on campus. Some students said that dining at POP! allows them to avoid waiting in the long lines that are common elsewhere on campus. Other students, however, don’t like that the food is premade and then delivered to campus. Chip Burr, general manager of Ole Miss Dining, said that POP! will experiment to identify which foods students like, while letting students try new kinds of food. One week’s menu, for instance, featured a falafel salad, while another week’s menu included Mexican street corn and grilled portobello tacos. Dodo Pizza’s owners, however, have different feelings about the change. One POP! employee, Lamarkus Banks, said people have been coming in hoping to find pizza, only to find Dodo Pizza’s on-campus location is no more. “One girl just walked away from the counter, stopped at the door for a few seconds, then sighed really loud and just left pretty mad,” he said. Because the menu changes weekly, it is posted Wednesdays on Instagram @OleMissDining and on Twitter @Ole_MissDining to keep students informed. “If students don’t take it with open arms, we’ll look at other options,” said Jason Puckett, a food service manager for Ole Miss Dining.